Forging was the first of the indirect compression-type process and it is probably the oldest method of metal forming. It involves the application of a compressive stress, which exceeds the flow stress of the metal. The stress can either be applied quickly or slowly. The process can be carried out hot or cold, choice of temperature being decided by such factors as whether ease and cheapness of deformation, production of certain mechanical properties or surface finish is the overriding factor. The time of application is relatively long. Over 90% of forging processes are hot. Titanium forging is the most common process in different manufacturing industries which is concerned with the shaping of the metal. Titanium forgings offer maximum impact strength, superior internal integrity, eliminating internal voids as compared to castings. Titanium forgings offer high strength, heat resistance and corrosion resistance. These features make it an ideal material for aerospace and chemical processing applications. Titanium forged components have been widely used in aircraft engine industry because of their superior specific strength to weight ratio at high temperature. Turbine disk is one of the most demanding forging parts. Certain alloys like 6AL-4v, 8Mn, 8Al-1MO-1V, 5Al-2.5Sn,and 6Al-2Sn-4Zr-2Mo, are also used in Aircraft engine applications due the ability of these alloys to with stand high temperature environments. The flow stress of titanium alloy Ti-6Al-4V is strongly dependent on temperature and strain rate during hot forging. Titanium forgings are highly required in different fields like the chemical, petrochemical, automotive and aeronautical industry. The fused product (ingot) doesn't have optimal mechanical features when purchased. For this reason, through the forging process, it is hot worked and transformed in other forms. We carry many compressed, large Titanium forgings, including forged bar, shafts, rings, discs, sleeves, and block. Titanium forgings offer a level of durability that cannot be achieved through casting or machining. The incredible strength of Titanium combined with the continuous internal grain uniformity caused by forging, results in a virtually indestructible piece. In this way is it possible to obtain shafts, plates, rings, valves, flanges, etc. : under this form titanium has better mechanical features which can be find in the ASTM/ASME 381 international standards. 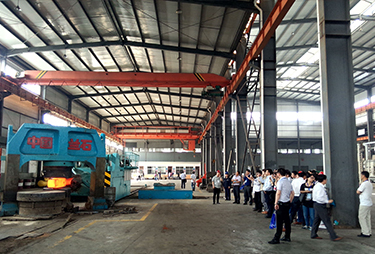 To realize this kind of process, TNTI is equipped with 1600 tons and 4500 tons presses, and six ovens. The ovens have temperature control tools which are precisely certified and fine-tuned to guarantee the best reliability of the provided product. Such a process makes the metal ready to be used in a variety of manufacturing operations in the industries. 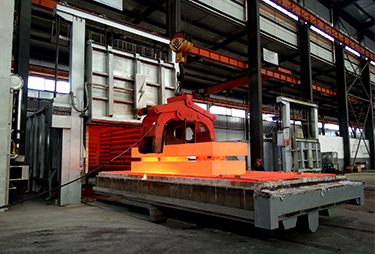 To further meet your specific forging requirements TNTI offers value added operations including: heat treating, physical testing, non-destructive testing, rough machining and finish machining. TNTI provides a full range of post-forging inspection, machining and finishing services with the certified quality you need to meet demanding application requirements.